If you’ve lost your hair due to chemotherapy treatments, you may have gotten a wig to get you through until your treatments are over and your hair grows back again. Wigs help us feel confident, beautiful and “normal” as we fight cancer, but they can also be difficult to wear. “I kept lifting the forehead to scratch,” says survivor cebula. If you’re experiencing some uncomfortable sensations when wearing your wig, don’t despair. There are a few things you can do to make it better. Choose a quality wig.Some people get into trouble when they try to save money. Low-quality wigs are more likely to itch and feel uncomfortable. You’re going to be wearing it for a few months at least, so don’t skimp on cost. (Your insurance may cover it-check our post for more information.) Take your time and find a quality wig that feels good. Some survivors recommend synthetic hair over real human hair, saying it washes easier and stays comfortable longer. Rinse thoroughly. Remember those days when your real hair went limp because either a) you didn’t rinse it well enough, or b) it had too much product buildup? The same thing can happen to your wig, so after washing, be sure to rinse thoroughly. 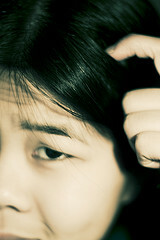 Any leftover shampoo or conditioner residue can cause scalp irritation. Plan a refresher. If you’re going to wear the wig all day, or at least for a few hours, plan to refresh your scalp several times. Take along some organic witch-hazel (try Thayer’s alcohol-free unscented brand) and every so often, steal into a private place, remove the wig, wet a towel, cloth or cotton pad with the witch hazel, and pass it over your scalp. It will help remove oil buildup and make you more comfortable. You may also want to take along a small bottle of your gentle, non-toxic face moisturizer or your cooling, spray toner to apply to your scalp afterwards. We love the organic soothing gel by Dr. Alkaitis and the Aloe Vera Cooling Spray by SantaVerde to soothe sensitive skin on your face and scalp. Consider a cotton liner. A 100% cotton liner can be worn under your wig, which will help absorb moisture and heat, making your head feel more comfortable. You can get them at almost any wig shop, or go online. A Jon Renau brand, for example, sells for only $5.99 at aaa-medical-wigs.com, or you can get one from Friends Boutique for $5.00. You can also send the wig back to the manufacturer and ask for a silk lining, which according to hairstyling expert Kimberly Belk, is the most comfortable. Carefully care for your wig. As your wig suffers wear and tear, strands of hair can come back through the base, which can also cause itching. You can help reduce this tendency by always caring for your wig according to the manufacturer’s instructions, and by brushing and combing carefully. Use zinc lotion for skin irritations. If you notice bumps, redness, and irritation on your scalp after wearing your wig, you may want to try an organic zinc lotion. Zinc is a natural antibacterial and can help prevent infections and irritations. Try Yin Yang Organic Skin Care’s Scalp Cream. Do you have tips for making wigs more comfortable? Please share. Photo courtesy dreamyourealive via Flickr.com. Hi, Ernestine. Looks like there are several places online that carry the cotton ones. Skullcapcity.com, ravelry.com (they also call them “chemo caps” here— http://www.ravelry.com/patterns/library/cotton-skull-cap-ii-chemo-cap), rakuten.com (http://www.rakuten.com/th/cotton-skull-cap.html) and I think Amazon carries them, too. Hi, Patti. Thanks so much for sharing your story! I’m inspired by your strength and positive attitude! It is wonderful that wigs can help us feel so much more confident and comfortable in our daily lives. I checked out Follicure—looks like it contains some preservatives that I wouldn’t really recommend (urea and parabens), but I don’t know if they would contribute to hair loss. It also has SDA 40, which is a type of alcohol. According to the material safety data sheet on this ingredient, skin contact can aggravate dermatitis. Ethyl nicotinate may also be irritating to the skin. Might I recommend to you my Rescue & Relief Spray? (Available here: http://cvskinlabs.com/shop/rescue-relief-spray/) It’s perfect for carrying with you and spritzing down the scalp during the day—and it’s extremely nourishing to the skin with NO harmful chemicals or preservatives. If you try it, let me know what you think! Otherwise, thanks again for the share. All the best. I recently needed to start wearing a wig due to alopecia. I have very sensitive skin, but was able to wear my wig for the entire day without itching by putting plastic wrap over my scalp than a MIPAN magic silver fishnet ‘anti-bacterial’ wig cap over the plastic wrap and a gel band as the top layer before the wig. I also put a bobby pin on each side, pinning the wig to the gel band in the front, and it was very secure. Hope this formula helps someone else too! I am wearing a synthetic wig and am expericing red scalp and itching. Would head and shoulers shampoo 2 in l help? Wait-Don’t Put Your Food in Plastic Containers That Could Contain BPA!